Midway is starting to make the "spring rounds" across the traditional and online media offices and is bringing along their latest Mortal Kombat project, Mortal Kombat: Armageddon for the Nintendo Wii. First stop seems to be always the Mortal Kombat friendly Game Informer. GI got some time with the Wii fighter and put together some impressions and a few more tidbits. Under the oversight of Mortal Kombat: Shaolin Monks producer, Shawn Himmerick, MK: Armageddon for the Wii will feature exclusive additions to the PlayStation 2 and Xbox versions. Exclusives include, a training mode that teaches special moves and how to link them, an Endurance Mode similar to the mode featured in Mortal Kombat: Unchained for the Sony PSP, and the addition of Khameleon. In addition, a new basic move is introduced allowing the player to "lie down flat" in order to avoid any projectiles or high attacks, while still being left open for low attacks and ground slams. 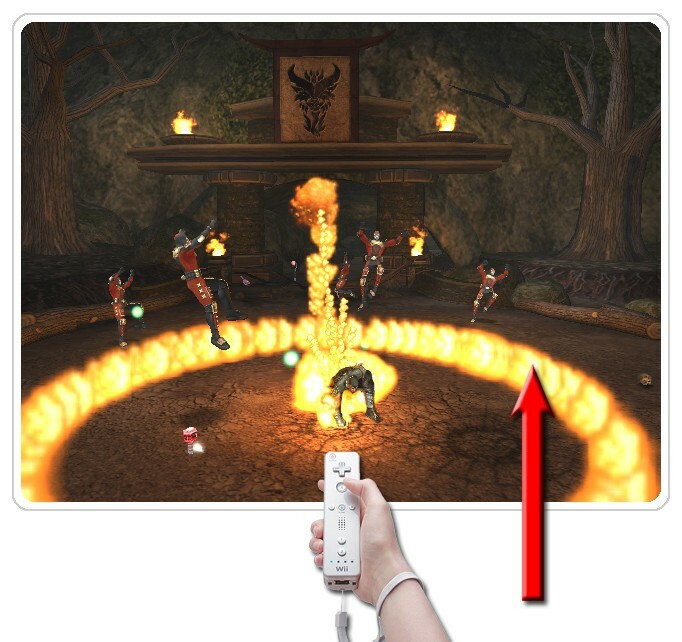 Another small detail revealed was the use of the Wii remote speaker, as a sound will confirm the entry of a special move using the B button and arm motions. As we played the game, one thing we noticed quickly is we performed many more supers than we would have with the PS2 or Xbox version. It mainly was a battle of the supers until we realized we had normal attacks to vary up the battle. But since supers are so much simpler to pull off, it�s more than likely they�ll be much more frequent additions in battles. However, performing supers all the time against experienced opponents will most likely get you killed, so keeping a good balance of regular moves versus super moves will help your success rate. Check out a few more screenshots, details and some thoughts on multiplayer and the Motor Kombat mini-game in the rest of the Game Informer article. In addition, a gameplay video also features a good smattering of everything from Konquest to Kreate a Fighter. Mortal Kombat: Armageddon for the Nintendo Wii plans to support progressive scan and widescreen modes and is currently planned for a Mid-May 2007 release. Well I'm glad they didn't have anything negative to say. Easier special moves can't be a bad thing. Anyway I'm excited for Khameleon, Endurance, and this training is new wassup with that? Lying down? WIERD! But I'm sure I'll love it.